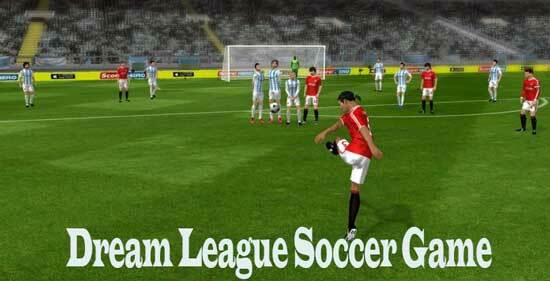 Dream League Soccer is an association football video game which is developed and published by First Touch Games. First Touch Games are a game developer from Oxford, England. The DLS game is available for both iOS and Android users. The gameplay is very interesting and allows you to build your own dream team. You can recruit real FIFPro players and can customize your team players. The game allows you to play in competitions to reach the top position.The teams of the game mostly from European countries. If you are looking for the best video game to play on your Android or on your iOS device offline, then Dream league Soccer is the best game. The game updates every year and it will be published with exciting features. The dream league soccer game is compared with Komami’s PES. One of the most interesting features of DLS game is that the game has acquired the International Federation of Professional Footballers license. So this will permit the game to use the official names of the players as well as their real faces in the game. After creation of team and customizing their players the users have to start playing the game in the league with various modest teams. There are many teams of this game some of the teams are Arsenal, Chelsea, Real Madrid etc. The users should start playing for winning the matches and by this way the users will be able to move to a higher level. You need to look after the facilities of your stadium and perform every possible thing in order to improve it. You have to create the team tactics of your team in order to make the strategy to win the match. The important thing that the user needs to do is that they need to sign the players for their team who are best and who helps you in winning the match. You need to make sure that you can review all the stats for the starting squats of your team. You have to take care of the members of your team and the needs of your team members. Now take a look to know how the gameplay starts and how you can operate the game. You have to use the three buttons which are pas, shoot and across, these 3 buttons are enough for you to enjoy the amazing control over the game and you can use these buttons to block and to make the long passes, long lobs, long dribbles and many more. Thus Dream League Soccer game is considered as one of the best soccer game that you can find on Google Play store and the best thing about league download this game is that it is free of cost and no charges are applied. You need to pay only to remove ads if you wish to remove otherwise, there is no need to pay a single amount for the game. The format followed in the game is just like the team format followed in the FIFA games. You can come up with your own football club from the word go! This means that you can start game first by being the manager of your team whose name can be changed. The manager will hire the players to participate in the football leagues. The manager of the team can also customize the soccer kits, team logo and the soccer boots. The graphics of the DLS game are excellent. You will never disappoint with how the game looks. The players on the game face the real reflection of the real players. The game allows you to create your own customized stadium. The game gives room for one to come up with what they like as opposed to conform to another person’s preference with regard to choice of stadium to play in. It is possible in Dream league Soccer game to change the duration per match. Another advantage to the game is that it gives flexibility of the game features to the user. This can also be seen by the ability of the manager to change the stadium, playing kits, team name and logo. You are simply not tied to one single setting of the game which brings monotony. The game is not difficult to play and therefore you don’t have a hard time to meet the objectives of the season, which always emerge the best team for the season. There are 6 divisions to compete and go to the next level are well outlined. This means that one’s team can easily rise up to be the best team in the entire globe. As it is an offline game, it reduces on costs of you as it is free to charge, this makes the game even more fun to play. You will only play money to buy the in game items which requires you to buy with real money. This is example to one who is accessing the coins market. Here you can buy the said coins with real money to speed up your game. This is entirely your choice to buy as it cannot prevent one from playing and enjoying all other aspects of the game to the fullest. This makes the game stand out from others which require one to be online in order to play or get a number of features unless you purchase them with real money. The game is easy to get started as either one can choose to watch or listen to tutorials that are available. You can also choose to learn yourself by starting the game then pausing it. First get to the settings menu then to the controls sub menu, you can observe what buttons do. From here it is possible to you to customize the functions of the buttons, to a convenient flow. There is an in game camera which gives you the perfect view of the pitch where you can choose the pitch that best suits your mode of playing. This depends on your preference style of controlling the players. You can change the choice the camera form “My Profile” icon on the game setting and choose different camera angles. You can also change the camera distance. All these features tend to bring more fun to the game as you can keep changing your style of playing with your changing preferences and likes. So DLS is the ideal game for all video football game fans. This game can be played by all age groups and social classes of people. This game doesn’t take much storage space on your devices. Once you installed this game on your device you can play offline. The game works perfectly on any device. If you have any doubts regarding the Dream League Soccer Game, please do comment below, we will reach you as soon as. Thank you for visiting our site.